Ruth writes: There are very few occasions when I wish I didn’t have to take pictures. Last Sunday was one of them. 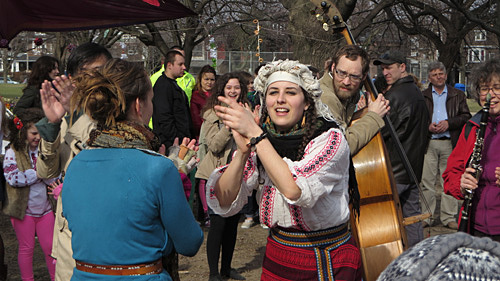 I wished I could have been dancing with the Ukrainians. 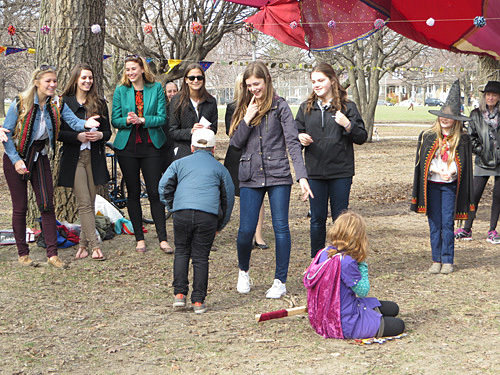 The occasion was “Easter Revels in the Park.” The park was Trinity Bellwoods and about a hundred men, women and children were enjoying the sunny weather and an event organized by the Kosa Kolektiv. It succeeded brilliantly. 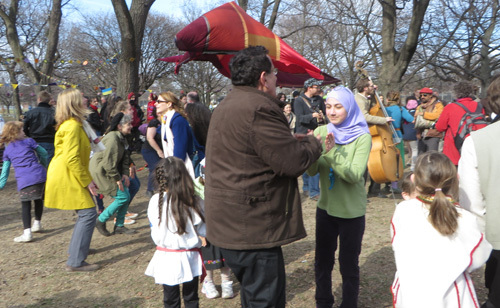 The revels were a lot of fun and no one needed expensive equipment to enjoy themselves. It started with some beautiful folk songs sung acapella. It continued with skits – the boy volunteer in the white cap here is changing his mind and about to run away when he learns that he has to kiss the seated maiden. They invited us to wash away winter. 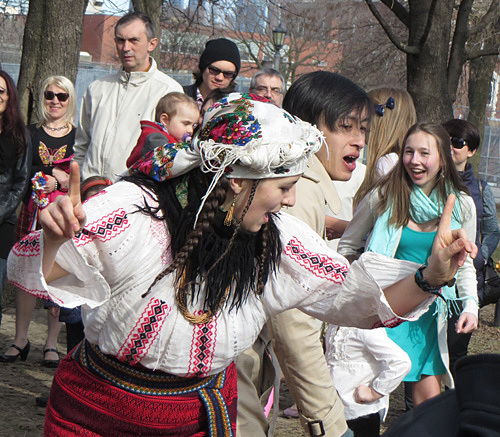 I was so delighted to see not just Ukrainians taking part, but many other Torontonians as well. 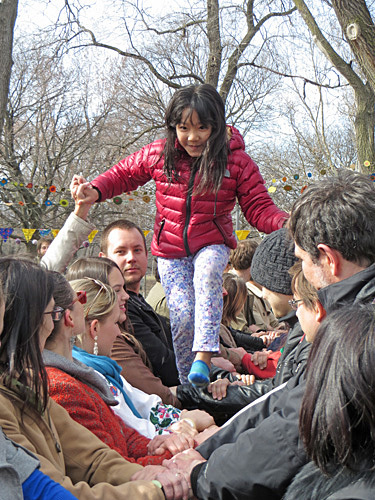 This young lady was among the children negotiating a bouncing path made of human hands. Members of the collective taught us the steps of the dances in English. It was good to see that age was not a barrier to participating. 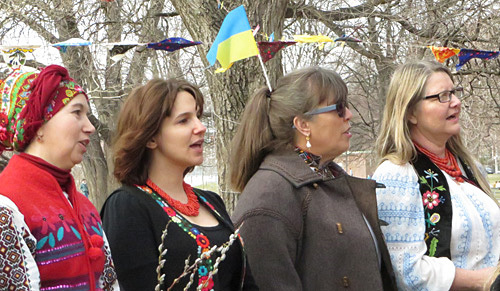 The songs were in Ukrainian, but afterwards the smiling ladies explained in English what they were about. One song celebrated the planting of pear trees and then eating the fruit. 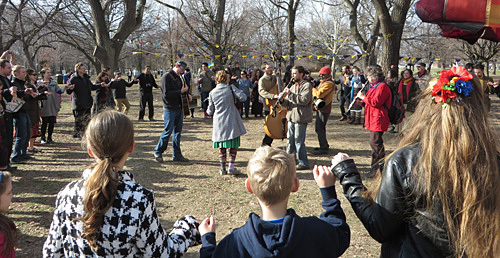 And some members of my favourite Lemon Bucket Orkestra were on hand to enhance the Ukrainian rhythms. The group’s website is at: http://kosakolektiv.com/about/. I’m looking forward to future events. 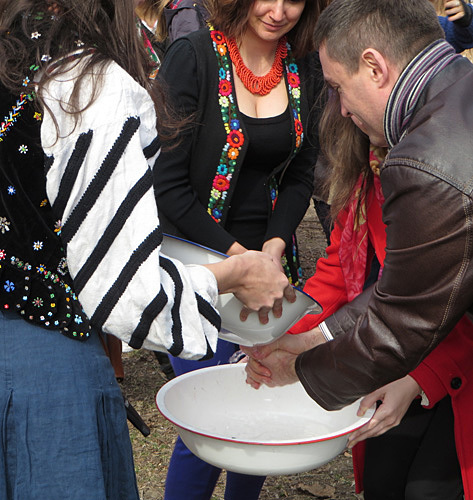 Did your Ukrainian friends invite you to this bash? Lucky you if they did. But anyone, like me, could just show up and join in the festivities. Thanks to Sophia Podrozny for telling us about this event. Please consult www.torontomulticulturalcalendar.com and www.twitter.com/torontomulticul for information on such future events. Like most, it was free of charge.